Migraines are much more than just a headache. A study of 27,800 women found that migraines accompanied by visual disturbances (like blind spots or flashes of light) was the number two risk factor for heart disease – second only to high blood pressure. This type of migraine may be a sign of impaired vascular function that could predispose sufferers to blood clots. 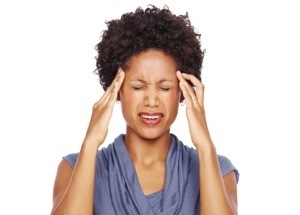 If you experience these headaches, have your doctor monitor you for other heart disease red flags. “When the researchers looked at heart disease risk factors, they found it was as important a risk factor as high cholesterol, diabetes and high blood pressure,” says Cleveland Clinic cardiologist David Frid, MD. Though it doesn’t mean every woman with migraines will have heart disease, it does mean those women should pay closer attention to their heart health. Frid says it’s important to identify as many risk factors as possible when assessing risk for heart disease, including high blood pressure and diabetes.